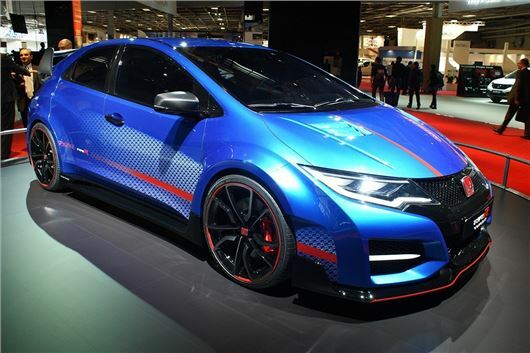 Honda has shown a ‘concept’ version of the new Civic Type R at the 2014 Paris Motor Show. It may be billed as a concept but the show model, finished in blue, is more or less the car we’ll see on sale in the UK in 2015, albeit in different colours. Prices should start at just under £30,000. The aggressively styled Type R features a huge rear wing with integrated brake lights, a rear diffuser, quad tailpipes and large, 20-inch alloy wheels. The front features a new headlight design and a larger grille. Power comes from a 2.0-litre turbocharged petrol engine with 280PS. It’s the first turbocharged Civic Type R – predecessors all used naturally-aspirated engines. Performance and torque figures are to be announced, but expect a 0-62mph sprint of around six seconds. Honda has installed adaptive damping, which changes the suspension characteristics based on road conditions and speed. At low speeds the focus is on comfort – but at higher speeds the dampers firm up to reduce body roll and sharpen handling. Another new feature is a +R button, which changes the engine mapping, throttle response and steering to make the car more responsive when the driver chooses. Transmission is a six-speed manual, which has been chosen to deliver more control to the driver than a paddle-shift automatic, according to Honda engineers. The new car has been developed and engineered for Europe and will be built at the Honda plant in Swindon.